The 1943 copper-alloy cent is one of the most enigmatic coins in American numismatics  and reportedly the most valuable Lincoln penny of all. Just 40 of the coins  probably created by accident, on copper-alloy one-cent blanks left in the presses in the wartime years when pennies were converted to steel  are known to exist. 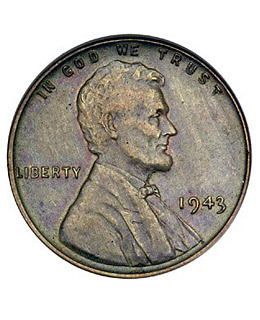 The first 1943 copper cent was sold in 1958 for more than $40,000. In 1996, another went for a whopping $82,500. But those sales pale in comparison with the latest: this week, a dealer in New Jersey sold his 1943 penny for a staggering $1.7 million. Their collection value makes 1943 copper pennies a prime target for counterfeiters: fakes are often made by coating steel cents with copper or altering the dates of 1945, 1948 and 1949 cents. How can you tell if your 1943 copper penny is real? Use a magnet. If the penny sticks, it's not copper. Better luck next time. Read a TIME cover story on penny-pinching in the recession.